Matured in ex-bourbon barrels and finished in ex-Madeira casks for a smooth, light character, this has aromas of cream toffee, rich fruit and raisins. The palate is well-rounded with the sweetness to balance light dryness followed by finishing notes of tropical fruit, raisins and vanilla. Non chill filtered. Welsh Gold is extremely rare and precious and was worn by legendary Welsh princes. These qualities are shared by our Gold collection of premium strength whiskies. 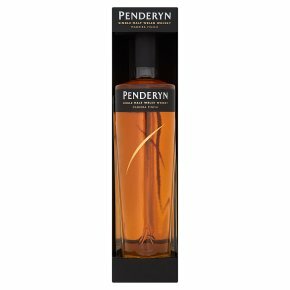 Penderyn Single Malt has a light fruitiness, generous flavour and a subtle complexity. Our unique stills produce a spirit of extraordinary strength and purity. This is married with our own natural spring water, matured in the finest ex-bourbon barrels, and finished in hand selected ex-Madeira wine casks. Tasting Notes Nose: A classic freshness with aromas of cream toffee, rich fruit and raisins. Palate: Crisp and finely rounded, with the sweetness to balance an appetising dryness. Finish: Notes of tropical fruit, raisins and vanilla persist. Balance: Oaky vanilla tones / dry sweetness.